The Standing Dumbbell Shoulder Press targets Deltoids and Triceps. Keep your back straight while you bring the dumbbells to shoulder level. Your wrists should be in a semi-supinated position with your thumbs pointing to your back. 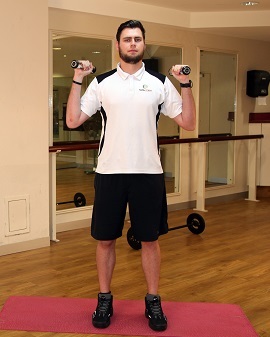 Press the dumbbells straight up vertically with a slight rotation of the wrists so your thumbs now face inwards. Once you have reached extension control the weight as you bring it back down to shoulder level and the wrists are in the starting position. Be sure to always warm up properly before any exercise. It is best to learn the movement before adding more weight. If you have any type of health issue, make sure you get clearance from your doctor before performing this exercise. 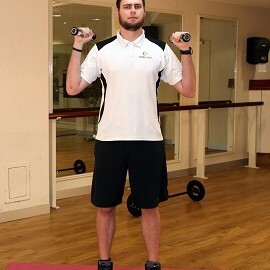 If you are unsure of your ability or are concerned about injury, seek the guidance of a qualified fitness professional.